UKSC is the first and only sugar packet collector's club in the UK. Sucrologists collect the little packets of sugar you get when you order tea or coffee in a cafe or restaurant. There are thousands of packets available in a number of different styles, shapes, designs and colours. The public area of these pages contain information about how to go about collecting sugar packets and what packets are available. 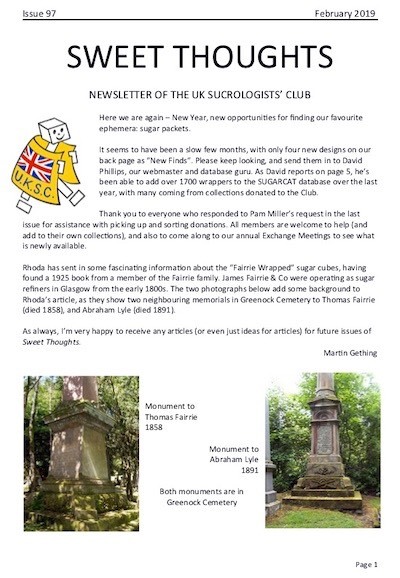 There is information about our newsletter, some past articles and a demonstration version of the online catalogue, SUGARCAT. If you are a collector, or would like to begin the hobby, we strongly encourage you to join the UKSC. UKSC members receive a quarterly newsletter containing information about recent sets and packets together, with a range of articles of interest to collectors. You can opt to receive the newsletter in printed format through the post, or as a PDF via e-mail. Members are also given access to the members’ area of the website which contains SUGARCAT our developing online catalogue of sugar packets, the New Finds Blog, new finds database, colour downloads of the newsletter, printed pages of UK sets, membership list, some ePub files, other finds database, and some Tate & Lyle wrapper checklists. Members are also sent packets on a regular basis and can make use of the club's stocks. We hold an annual collectors meeting and there are occasional smaller regional meetings. Details of all updates to this site, both in the public area, the members’ area and SUGARCAT, are posted on the weblog, which you can access using RSS. New finds are posted on the New Finds Blog in the members' access, also using RSS, but requiring password access.